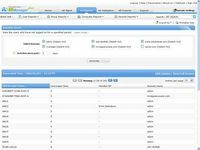 Nuxeo EP is an innovative open source Enterprise Content Management (ECM) platform, based on modern Java EE standards and components. It can be used to implement document management, knowledge management, digital assets management or workflow applications, managing up to millions of documents and terabytes of data. With its service-oriented architecture, it is extremely easy to configure, extend and integrate into your information system. Deployed on a Java EE 5 application server, it leverages the full potential of the Java EE 5 platform, including: clustering, high-availability, manageability, integration within your information system, development tools support. Nuxeo EP is a global solution ready to take on challenges of this new era of information management (Web 2.0, increasing quantity of digital information, lots of emails, offline work, mobility, etc.). Nuxeo EP is designed to be used from a web browser such as MS-IE or Firefox, with a rich, Ajax-based, interface, from an office suite such as MS-Office, or from a Nuxeo RCP application. 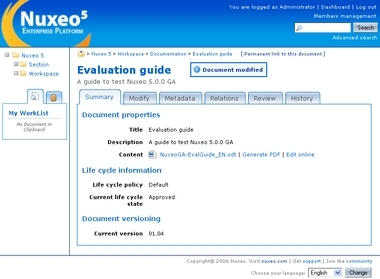 The Nuxeo EP default configuration provides both collaborative work and publication through a functional separation between workspaces and sections: - Workspaces: provide to end users a toolset to achieve document management and collaboration (document sharing, versioning, relations, access rights, etc.). Workspaces offer an innovative approach to leverage teamwork and to manage documents in a collaborative way (from the creation to the archiving phase). - Sections: provide hierarchical views to access the validated content produced in workspaces and can be used as a website hierarchy or as a file plan. System requirements: Java 5 runtime environment on a machine with more than 1 Go of RAM.